Coke quencher. By Barney Rubble. A fine view across the Bradford Road gas works - at the time Manchester City Council were investing heavily in their gas undertaking, the new works at Partington had formally opened 4 years earlier and the older city centre gas works such as Bradford Road were being altered. 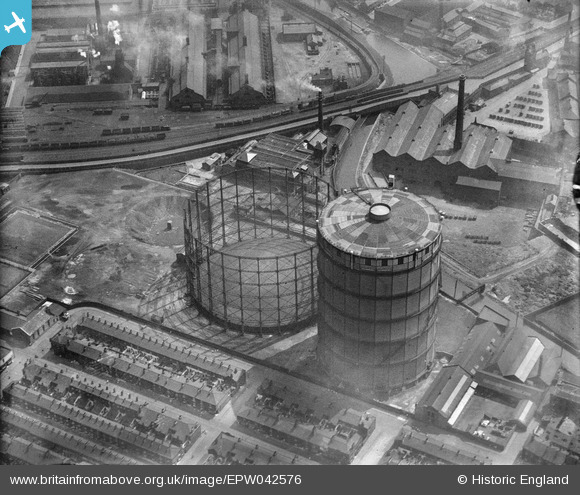 This view shows what I think may be the remains of the earlier gas holders to the left - in the 1933 Annual Report of the Council mention is made of a new waterless gas holder at Bradford Road standing 248ft high - I suspect that is the structure casing such a shadow over the cramped houses of Glebe St shown atht he lower edge of the image?